Super Skirt Soaking! - Miss Pink gets supersoaked, sits in the river, and gets bucketed! Miss Pink, in uniform, gets supersoaked! Miss Pink and Nurse Wendy continue their wet adventures on the riverbank. Now it's Miss Pink's turn to enjoy a supersoaking! She starts off sitting on the bank, already dressed in her skirt and blouse, bathing her bare feet in the fresh, clear water. She slips her matching blue wellington boots on, and walks calmly out into the ankle-deep water. Her nice dry skirt comes to just below the tops of her boots, and she looks really smart standing in the shallow water. But she doesn't stay dry for long! 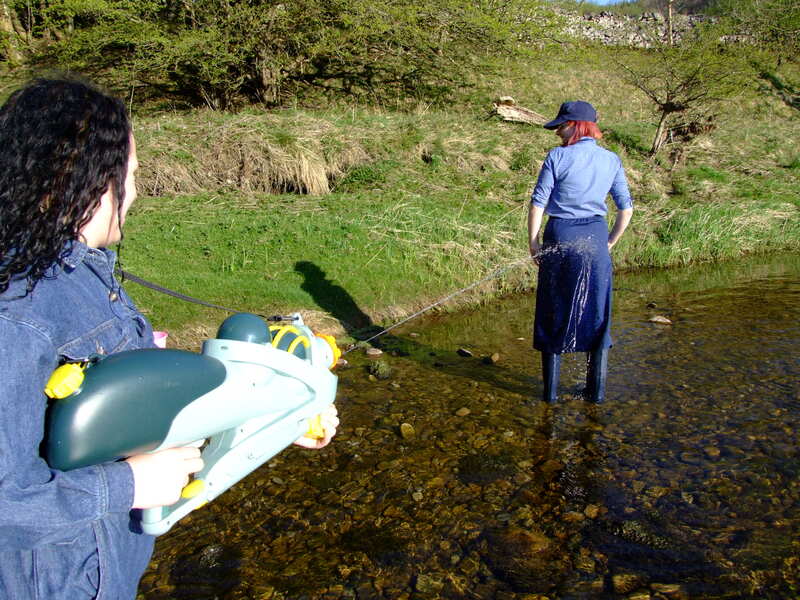 Nurse Wendy, now dressed in a fresh dry denim jumpsuit and black wellies, hefts the fully loaded Supersoaker, takes careful aim at Miss Pink's skirt, and opens fire! In moments the back of Miss Pink's skirt is soaked, the jet from the water gun playing back and forth across her bottom and up and down her skirt, drenching the back of it completely. She remains in place while several more full supersoaker loads are sprayed over the back of her skirt. Now she's partly wet Miss Pink goes exploring, wading into the deeper parts of the river, slowy drenching the front of her skirt to match the already wet back, and going on to soak her blouse too. She plays in the water and with the trees that overhang the bank, before coming back to the shallows and sitting down in the water - where Nurse Wendy pours several full buckets of water over her! The now totally drenched Miss Pink continues to play in the water, sitting, crawling, lying down on her front. She sits up, takes her cap off, fills it, and splashes it back onto her head, water cascading everywhere as she does so. Eventually, after striking a series of soaked poses both standing up in her drenched clothes, and sitting down again in the water, Miss Pink wades back to the riverbank and sits down on the grass. Where Nurse Wendy pours another bucket of water over her! A very soggy Miss Pink is left sitting on the bank, sunlight reflecting from her completely saturated clothes.